The residential portion of the Manchester neighborhood is roughly bounded by Chateau Street to the west, Western Avenue to the south, Allegheny Avenue to the east, and the Conrail railroad tracks to the north and northeast. Manchester is located north of Downtown, and is surrounded by Chateau, California-Kirkbride, Central Northside, and Allegheny West. The neighborhood was originally supported by industrial and wharf activity situated on the shore of the Ohio River, and factories loosely woven into the community. Manchester is almost exclusively residential. However, the community is served by the nearby Allegheny West commercial district. The parks surrounding Allegheny Center, as well as the Children¿s Museum, the National Aviary, the Carnegie Science Center, Heinz Field and PNC Park offer a variety of recreational opportunities. Manchester is experiencing what some call its "second golden era." Residents in this area are working to restore the beautiful and often elegant homes that rest among the neighborhood's tree-lined streets. 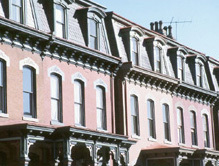 Architecturally distinguished brownstone row homes sit side by side with newer, energy efficient houses adding to the character of the neighborhood.